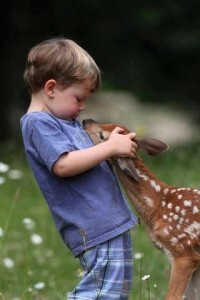 There can be no pursuit of happiness, either you are happy or you are not. Happiness is a state of being, it is what you feel in the moment without fear, judgment, attachment, or expectation. Pursuing, people, places and things in an attempt to make you happy is a fools game and at best, one that will only bring you temporary results that leave you wanting more. Instead of pursuing happiness, one needs to pursue the reason and truth of why you are unhappy, and then to heal that. When you find the cause of your unhappiness and heal it, what you are left with is being in a state of happiness. The pursuit of happiness is also intertwined with false hope, dreams and desires that “if” you can just have or do what your Mind thinks it needs, that you will be happy and satisfied. Trying to pursue happiness is like a donkey trying to reach a carrot that is dangling from a pole attached securely to a cart that the donkey is pulling. 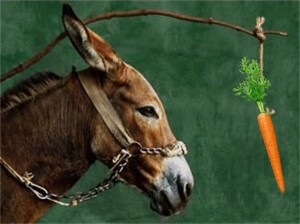 The carrot will always be just out of reach and no matter how hard the donkey tries to reach it, he will never succeed. This entry was posted in Fear - Terror, Feelings - Emotions, New Age, Self-Empowerment and tagged attachment, carrot, desires, donkey, dreams, expectatiom, false, fear, Happiness, hopes, judgment, person, persuit, place, thing by johnrieger. Bookmark the permalink.